An alleged document of the transcript of Tariq Mir's interrogation leaked earlier has been disowned by the London Police. However, the Police did not comment on the veracity of the contents of the transcripts. These documents have surfaced since the release of a BBC story by Owen Bennett Jones alleging that some MQM leaders, including Altaf Husain, have been receiving money from India's intelligence agency Research and Analysis Wing (RAW). What began as murder investigation after the London killing of former MQM leader Imran Farooq later expanded to include money laundering after the discovery of several hundred thousand British Pounds in cash at MQM chief Altaf Husain's residence. It was this turn of events that led to interrogation of Mr. Tariq Mir, the MQM party finance manager in the UK, and others, including Mohammad Anwar and Sarfaraz Merchant. 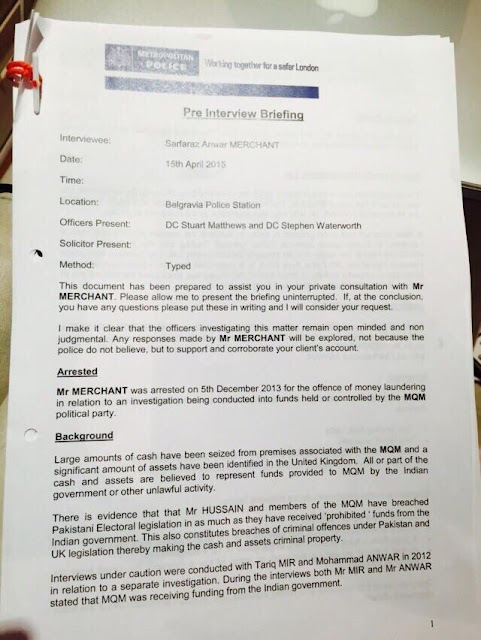 Evidence of Indian funding of Baloch insurgents, TTP militants and Karachi's MQM is mounting every day. The pattern seems to fit the Indian strategy of proxy war against Pakistan that has been articulated by Prime Minister Narendra Modi's National Security Advisor Ajit Doval as follows: "How do we tackle Pakistan? .. You make it difficult for them (Pakistan) to manage their internal security... Pakistan's vulnerability is many many times higher than India's....Taliban have beheaded 23 of their (Pakistani) soldiers...funding can be countered by giving more funds...more than one-and-a-half times the funding they have available and they'll be yours..the Taliban are mercenaries...go for more of a covert thing"
The Indian (Express) newspaper alleges that one of the Pakistani officials has claimed that individuals linked to the party received multiple remittances through Dubai’s RAK Bank from one Jasmine Valley General Trading through 2011, 2012 and 2013, totaling just under $ 1.5 million. The fact that Jasmine Valley has Indian nationals as owners, the source alleged, meant that it could be a RAW front. However, the public record shows that Jasmine Valley, far from being an entity fronting for Indian intelligence, is itself being prosecuted by the Directorate of Revenue Intelligence. The DRI, in 2001, filed charges against multiple entities linked to Jasmine Valley, saying the firm was used to under-invoice imports from Italy, China and Spain to avoid Customs duties. According to the report published by The Indian Express, several phone calls were made to numbers listed in Dubai business directories for Jasmine Valley, but they were all either switched off, or did not respond. No email address is listed for Jasmine Valley in any of six business directories this newspaper searched; only a post box address is available. When contacted by The Indian Express, Anwar did not respond to requests for a comment. If Altaf and his supporters feel that MQM leaders did not take any money from RAW and the BBC story by Owen Bennett Jones is baseless, then they should sue BBC for libel in a British Court. George Galloway did that when he was accused by Daily Telegraph of taking money from Saddam Husain. Galloway won a retraction, an apology and hundreds of thousands of pounds in the case. This year, no one from #MQM came to my place with fitra slips. They just hang a banner on the road and kept their quite. Change is here! Kashif: "This year, no one from #MQM came to my place with fitra slips. They just hang a banner on the road and kept their quite. Change is here!" #MQM forced #Fitra collection stopped in #Karachi. #India #RAW money under scrutiny. Cut #MQM funds to stop crime. Money laundering charges against Muttahida Qaumi Movement founder could have been dropped for political reasons, British journalist Owen Bennett Jones who has followed the case closely said in an interview with BBC Urdu on Friday. “Two senior leaders of the MQM confessed to the London police that India had funded them. There statements were recorded with the police. Police gave their case to the Crown Prosecution Service which faced international pressure and thought it is better to drop the case in view of public interest,” he said. The London police, he said, raided that MQM founder’s house to probe the Imran Farooq murder case. But they instead found a huge amount of money and list of weapons in his house, which triggered the money laundering investigation. Scotland Yard announced on Thursday that no “further action will be taken against Altaf Hussain” and others in the long-running money-laundering case, deciding to drop the investigation altogether and effectively ensuring that the sensitive evidence involved in this case doesn’t go to public for fear of causing rifts between Pakistan, the UK and India. The case against the Muttahida Qaumi Movement (MQM) Chief Altaf Hussain started in the end of 2012 when the police found a large amount of cash at the MQM’s International Secretariat. Scotland Yard said during the course of investigation that it had “credible evidence that the MQM received funds from the Indian government sources and broke the electoral laws of Pakistan and the UK”. The chief of the London faction of the Muttahida Qaumi Movement (MQM) Altaf Hussain, who is facing a ‘severe’ financial crisis, is set to fly to the Unites States soon after the elections there, Nadeem Nusrat, the party’s second-in-command, told The Express Tribune. Nadeem Nusrat, however, did not clarify how and when Altaf Hussain would go to the US. The visit, referred to as a ‘political’ tour, is expected to last as long as three weeks during which Hussain is expected to hold meetings with ‘important government officials’, representatives of think tanks, besides delivering lectures at various universities. He is virtually banned from conducting politics in the country. Authorities are persistently moving against his party. His once-close ‘lieutenants’ have dissociated themselves from him. He is wanted in a number of cases, in Pakistan, ranging from murder to sedition. And his accounts are running out of money. A source in the MQM-London said that the visit is planned to gain US support and apply indirect pressure on Pakistan government, urging them to end the ongoing crackdown against party workers loyal to his faction. “[Hussain] has been receiving invitations from America for quite some time. Party workers (over there) wanted him to visit by the end of this year. The plan has, however, been delayed,” said Nusrat, who returned to London from the US on Saturday afternoon. Asked if the MQM chief was medically fit to go on such a flight the party convener said that he was fine and fit to travel. Nusrat agreed that the party leaders in London had been facing a financial crunch over the past two-and-a-half-year period and the situation worsened over the past few months. Funds routed from Pakistan have completely dried, leaving them with no option but to seek funds from their comrades living in other countries. According to MQM insiders, the party followed a rigid fund raising regime. But, all channels for routing money to London have been shut down. Analysts believe that the August 23 decision of Farooq Sattar to divorce the entire London leadership had hurt Hussain. “He feels isolated. The Pakistan leadership, including those who got elected to assemblies on the party tickets doled out by him, stopped supporting him,” said Nadeem Nusrat. Although the MQM-London tried to re-enter mainstream politics with a new left-leaning team, spearheaded by Dr Hasan Zafar Arif, Momin Khan Momin and Amjadullah Khan, the authorities thwarted their collective attempt to take off the party by sending them all to jail. The London leadership is still in contact with “people in Karachi”, maintained Nusrat. Workers, he said, were being told to maintain a ‘low-profile’ until the situation improved. According to one party source, Nadeem Nusrat has consistently been communicating to party workers loyal to Hussain to hold steadfast “until Altaf Hussain travels to the US”. How #KulbushanJadhav led #India’s covert war in #Pakistan: Jadhav and #PPP affiliated #Karachi gangster Uzair Baloch developed a pivotal relationship 2014 onwards. Uzair's #Iranian passport enable him to freely move in and out of #Chahabar. Indian magazine Frontline, a publication of renowned newspaper The Hindu has revealed detailed accounts of India’s secret war inside Pakistan involving terrorist Kulbushan Jadhav, National Security Advisor (NSA), Ajit Kumar Doval and chiefs of the Research & Analysis Wing (RAW). Kulbushan Sudhir Jadhav bearing service number 41558Z was inducted into the Indian Navy in 1987, according to The Gazette of India which records promotions, commissioning and retirement of military officials. Two Indian navy officials relay that Jadhav’s transition into the notorious spy world began after the parliament house attack in 2001 when the Indian navy was setting up nine naval detachments to monitor the Maharashtra and Gujarat coasts but they lacked an independent intelligence capacity to monitor threats from across the sea. In 2006, the Balochistan insurgency exploded and the Indian intelligence community pressured their stations in Afghanistan to develop more contacts in the region. “Our new asset in Chabahar soon began to be drawn into counterterrorism work for the Intelligence Bureau – raising fears that the fact that he was still on the organisation’s payroll could lead to embarrassment,” stated Indian Naval Intelligence officials. According to sources, the Indian Navy Chief, Admiral Arun Prakash’s resistance to these efforts was overruled by the Indian Intelligence bosses because they were desperate for assets. “The Navy was extremely worried about the possible consequences of the tasks being assigned to Jadhav by the Intelligence Bureau. However, we were basically told that since he was there, that was how it needed to be,” said one officer. “The push to draw Jadhav into front-line intelligence work was driven by the IB’s ambitions to have an independent overseas role. RAW’s own intelligence capacities in the region, they argued, were more than adequate to address emerging threats,” stated former RAW officials. Sources said that Jadhav gave an idea about a reprisal attack on Karachi in case another 26/11 attack takes place which grasped the attention of top Indian intelligence officials. Sources confirmed that Jadhav and Uzair Baloch, a Karachi-based ganglord developed a pivotal relationship 2014 onwards. 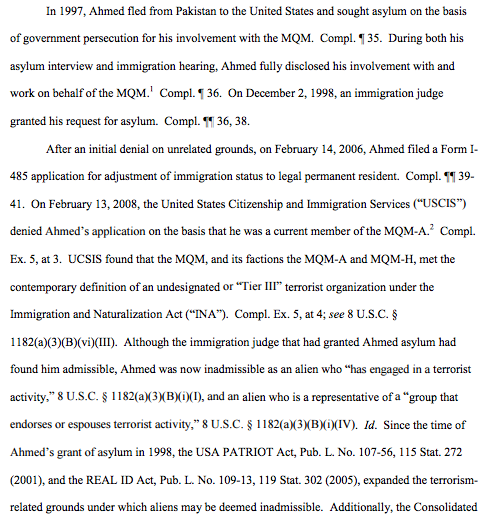 Due to the latter’s Iranian passport, he was able to freely move in and out of Chahabar. Jadhav’s next door neighbour was Jaleel Baloch who happened to be Uzair Baloch’s nephew. He used to take cash from Jadhav in return for useful information. Pakistan military sources insist that Jadhav made at least five deliveries of a huge cache of weapons to terrorists supporting the Baloch liberation movement. “Baloch was involved in espionage activities, by providing secret information/sketches regarding Army installations and officials to foreign agents,” reiterates an official Pakistani investigation document. However, the material he handed over appeared to be low grade. Last year Uzair Baloch was arrested in Abu Dhabi by the Interpol and handed over to Pakistani authorities. “Baloch’s interrogation, eventually led the ISI to the Indian whose operations in Chahbahar had gone undetected for over a decade,” Pakistani official sources confirmed. Subsequently, in April 2017, Baloch admitted in his testimony that he was in touch with terrorist Kulbushan Jadhav and Iranian intelligence.